Last issue ended with Damian, son of Batman, blowing up someone who looked like his father, but clearly wasn’t. (The white on black speech bubbles were a bit of a giveaway, to be fair.) This issue opens with an agreeably creepy line – “Come here, Damian. Be a good boy and put your father back together.” And gets steadily better after that strong start. What last issue was muddled and confused, this issue becomes clear. Without the complication of Professor Pyg’s ‘dollotrons’ and melodramatic dialogue, the true nature of the Batman attacking Damian – and the numerous cops and other characters following up that attack with some violence of their own – becomes readily comprehensible. They are corpses reanimated by, we later find out, dark mystical forces, intent on protecting the secret of the so-called Silent Seven, a shadowy criminal organization to which we were introduced last issue. And Damian, supremely skilled but over-confident, quickly finds himself in trouble. The corpse cops are simply too numerous and too strong for him. Cut to an increasingly concerned Bruce in (relatively) faraway Gotham and we’ve suddenly got (say it quietly) some genuine tension, that is only relieved by the unexpected and, from Bruce’s point of view, unwelcome intervention of The Shadow. A word about art here. It’s taken me a while to get used to Timpano’s artwork, but here it is excellent, managing to be both clear and dynamic. The page in which the foregrounded Shadow - upside down, one hand on the grip of a pistol, the other steadying himself on a nearby pipe – is poised ready to drop into the fray below, laughter ringing all around him, is just fantastic. 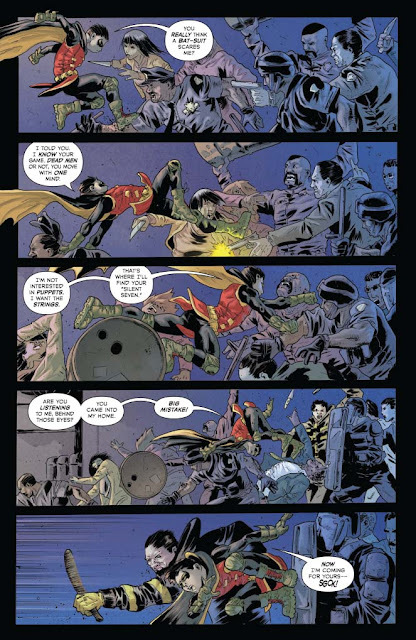 The Shadow’s intervention is enough to give Damian time to break free of the reanimated goons surrounding him, toss a bat-grenade in amongst them and, Shadow in tow, make good his escape. Already, the storytelling is several orders of excellence superior to what we got last issue. 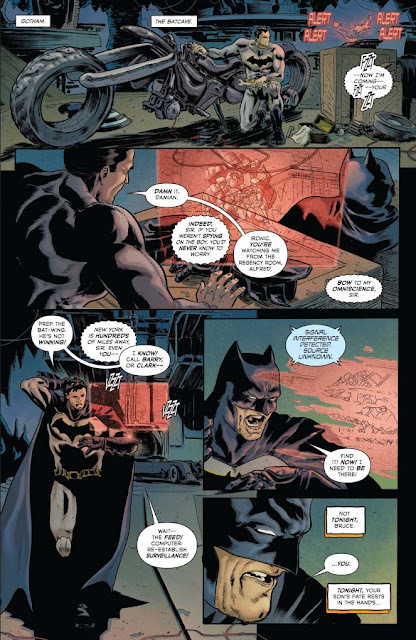 Timpano impresses again in the following page, a series of smaller panels taking us cleverly through an empty Wayne Manor and down into the Batcave, where Bruce is coming to terms with the fact that The Shadow has saved his son when he couldn’t. There then follows a conversation between Batman and The Shadow which manages both to be informative and stay just the right side of overly portentous. Perhaps more importantly, some important thematic links are established between this series and the previous one. Like The Stag, the Silent Seven come from “the darkness that lies always in [Batman’s] periphery”, operating in ways that become obvious once Batman becomes aware of them yet somehow capable of making it extremely difficult to spot them in the first place. As Batman himself says, it’s like “mass hypnosis” – an entirely appropriate observation given that it’s quickly revealed we’re dealing with probably The Shadow’s most dangerous foe, Shiwan Khan. A descendant of Genghis Khan, this is a man trained in the same techniques as The Shadow but dedicated to using them for more nefarious purposes. In a bit of a shock revelation (well, it was a shock to me), Khan has teamed up with Ra’s Al Ghul, which makes sense on not only a thematic level (they’re both planners and manipulators), but also on in terms of character. Now, the emphasis on Damian begins to make sense. 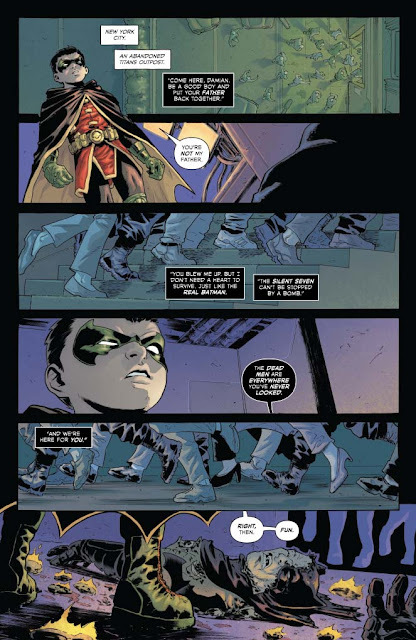 Speaking of whom, not happy with being treated like a child (The Shadow keeps referring to him as “boy”, which, let’s face it, is never going to go over well), Damian tries to convince his father and The Shadow that he’s capable of handling the situation on his own and leaves the pair of older vigilantes in the Batcave. This gives the two adults in the room a chance to air their grievances and, as might be expected, this takes the form of an argument that quickly becomes physical. The Shadow and Batman have fought before, of course, but this means something – to both men. And I must give Orlando credit for the way he scripts this. Both men are hugely damaged and dealing with different types of loss. 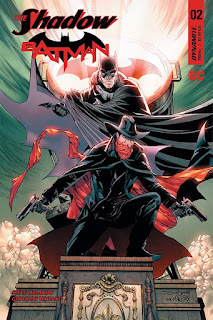 For Batman, it’s the immediate loss of Damian that he’s struggling with; for The Shadow, it’s the loss of Shamba-La, the loss of the opportunity of giving up his identity as The Shadow, and, more crucially, the death of Margo Lane that weighs upon him. And it is The Shadow who breaks, slumping in defeat, pouring out his emotions to a stunned Bruce. While the set-up might be a little forced, this moment of catharsis is remarkably powerful. At least some of this is due to Timpano’s art, which charts The Shadow’s collapse and communicates his brokenness not only in his posture but also in his tortured gaze. The issue ends in a decidedly unexpected manner that hints at a possible new direction for The Shadow and left this reader, at any rate, with a rather warm feeling inside. Whatever else I’d been expecting from this issue, it certainly wasn’t that! In keeping things relatively straightforward and concentrating on characterisation, Orlando and Timpano have produced an issue that is a huge improvement on the previous one. Building on the relationship between them forged in the previous series, both Batman and The Shadow come across as sympathetic characters here and it is a genuine pleasure seeing them team up at the end. Timpano’s art is always good and, at times, is extremely impressive. On the whole, I would say this is well worth a look.